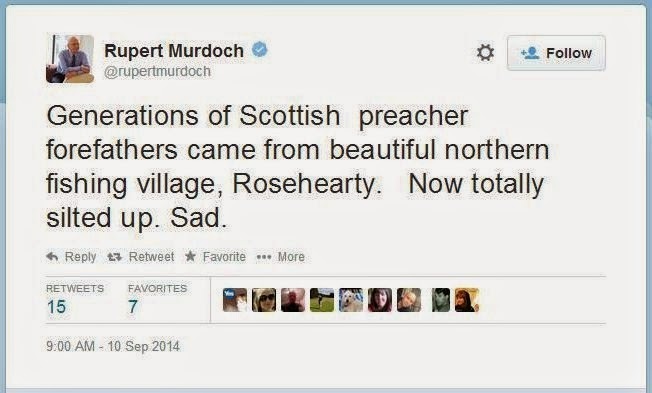 Rupert Murdoch can trace his roots back to Scotland, and in the run-up to last year’s independence referendum, he recalled the place from whence they had come: “Generations of Scottish preacher forefathers came from beautiful northern fishing village, Roseheearty. Now totally silted up. Sad” he reflected, just a week before the poll. And he was optimistic for the post-referendum period. That's what I think of youse bladdy disobedient politicians, ya bladdy Pommie drongoes! “Despite English patronising, whatever the outcome, extremists on both sides will fade, warm feelings return”. 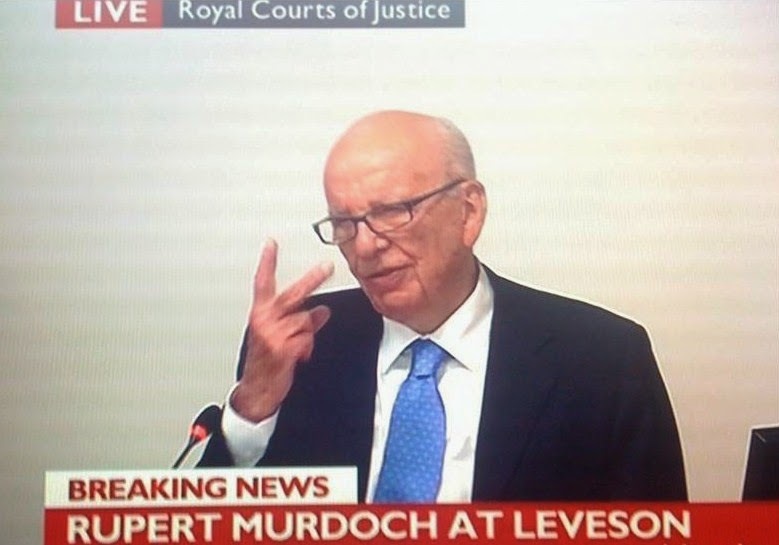 Rupe was clearly not impressed by those south of the border looking down on Scots. But there was a get-out, a sting in the tail: “Coincidence or fate? Sept 28 2014 [is] 700 years since Battle of Bannockburn threw off English yoke. But now SNP wants to swap UK rule for EU”. 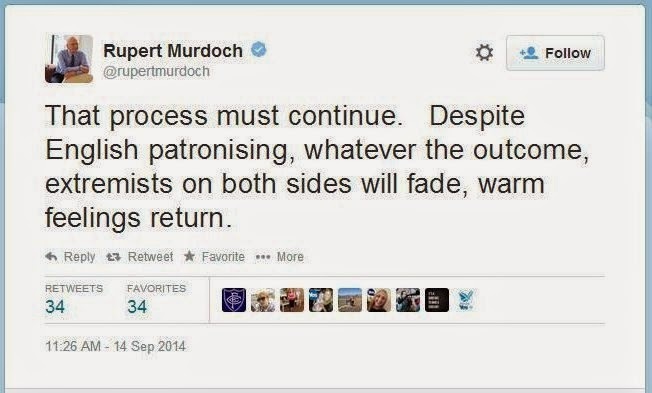 Thus the flexibility of the Murdoch position was ensured, and so it should be no surprise to see the Super Soaraway Currant Bun demonising Scots, or at least the SNP, but only in England. In the run-up to the last Holyrood elections, though, the Sun was backing Alex Salmond to the hilt. As the title is now Scotland’s biggest selling paper, Murdoch’s siding with the SNP was seen as a significant benefit. 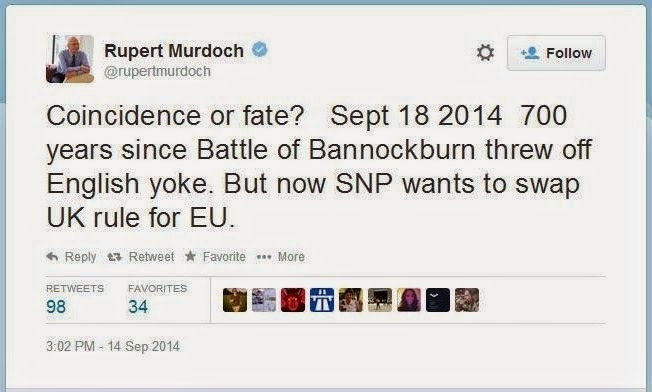 Rupe was sympathetic to the Nationalists during the referendum campaign, too, telling anyone who would listen that Salmond was the only one in the campaign was was “connecting” with voters. But Murdoch is more interested in keeping Mil The Younger - a politician he cannot bend to his will - out of power. So that means playing both sides of the field, backing the Tories and the SNP. You think I jest? Consider this recent article from the Sun, titled “Tartan Barmy”, and depicting a bikini-clad Nicola Sturgeon perched on a wrecking ball. We are told of “Ed SNP Pals”, that “Labour is plotting Scottish alliance”, and just in case you didn’t get the message, the Tories’ own wrecking ball propaganda with the background title “A recovering economy” is thrown in. As Sir Sean nearly said, I think we got the point. 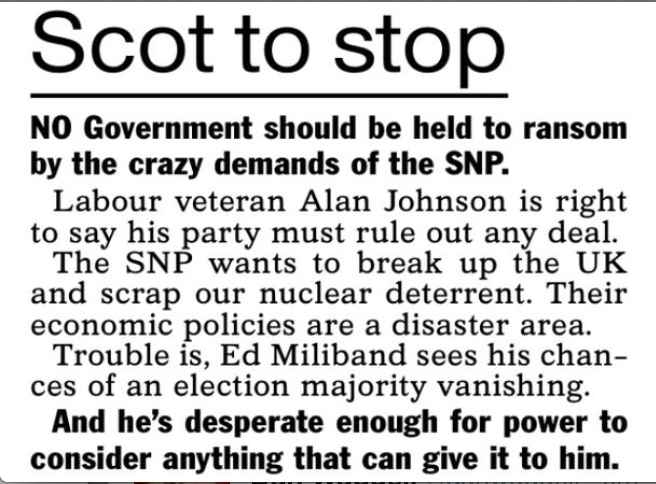 This has continued in a Sun editorial available, it seems, only in print form, titled “Scot to stop” and telling “NO Government should be held to ransom by the crazy demands of the SNP … Labour veteran … is right to say his party must rule out any deal … The SNP wants to break up the UK and scrap our nuclear deterrent. Their economic policies are a disaster area … Trouble is, Ed Miliband sees his chances of an election majority vanishing … And he’s desperate enough for power to consider anything that can give it to him”. Nobody will be surprised to discover that neither the highly disobliging portrayal of Ms Sturgeon, nor the editorial calling the SNP “crazy” and a “disaster area”, have made it into the Scottish edition of the Sun. As former Labour MP Brian Wilson says in today’s Scotsman, “Miliband stood up to Murdoch … Murdoch has a lot of unfinished business with Miliband”. The old Mafioso believes he is still strong. And he won’t finish until he’s finished Miliband. Unless he finishes himself first. Battle of Bannockburn occured on the 23-24 June 1314. Rupe ignorant of the facts once again, Quelle surprise.